Carbohydrates are one of the four major classes of biomolecules along with proteins, nucleic acids, and lipids. Carbohydrates are compounds that contain at least three carbon atoms, a number of hydroxyl groups, and usually an aldehyde or ketone group. They may contain phosphate, amino, or sulfate groups. First, carbohydrates serve as energy stores, fuels, and metabolic intermediates. Second, ribose and deoxyribose sugars form part of the structural framework of RNA and DNA. Third, polysaccharides are structural elements in the cell walls of bacteria and plants. Carbohydrates are also known as saccharides since many of those of relatively small molecular weight have a sweet taste, although this is not true of those with large molecules. They are widely distributed molecules in both plant and animal tissues. They are indispensable for living organisms, serving as skeletal structures in plants and also in insects and crustaceans. They also occur as food reserves in the storage organs of plants and in the liver and muscles of animals. In addition, they are an important source of energy required for the various metabolic activities of the living organisms; the energy being derived as a result of their oxidation. They also serve to lubricate skeletal joints, to provide adhesion between cells and to confer biological specificity on the surface of animal calls. the precursor for synthesis of all the other carbohydrates in the body, including glycogen for storage; ribose and deoxyribose in nucleic acids; and galactose in lactose of milk, in glycolipids, and in combination with protein in glycoproteins and proteoglycans. Diseases associated with carbohydrate metabolism include diabetes mellitus, galactosemia, glycogen storage diseases, and lactose intolerance. Monosaccharides are colorless, crystalline solids that are freely soluble in water but insoluble in nonpolar solvents. Most have a sweet taste. The backbones of common monosaccharides are unbranched carbon chains in which all the carbon atoms are linked by single bonds. In this open-chain form, one of the carbon atoms is double-bonded to an oxygen atom to form a carbonyl group; each of the other carbon atoms has a hydroxyl group. If the carbonyl group is at an end of the carbon chain (that is, in an aldehyde group) the monosaccharide is an aldose; if the carbonyl group is at any other position (in a ketone group) the monosaccharide is a ketose. The simplest monosaccharides are the two three-carbon trioses: glyceraldehyde, an aldotriose, and dihydroxyacetone, a ketotriose. 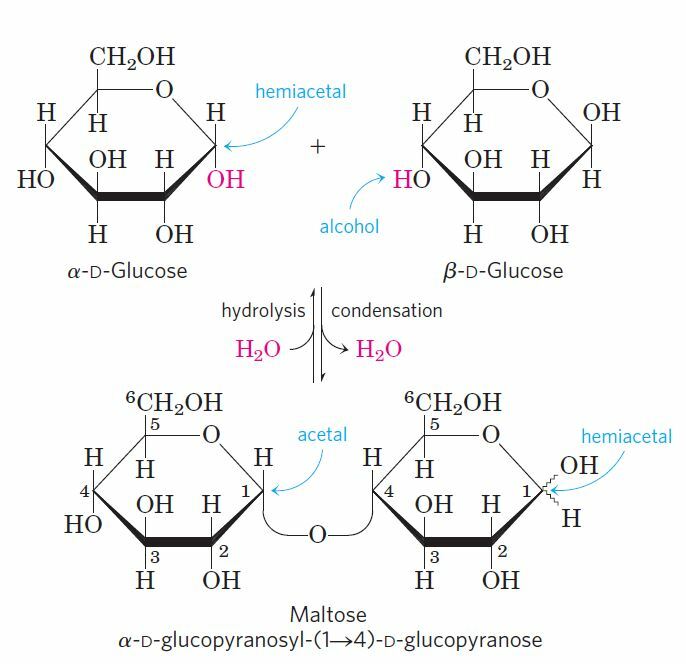 Disaccharides (such as maltose, lactose, and sucrose) consist of two monosaccharides joined covalently by an O-glycosidic bond, which is formed when a hydroxyl group of one sugar molecule, typically cyclic, reacts with the anomeric carbon of the other. This reaction represents the formation of an acetal from a hemiacetal (such as glucopyranose) and an alcohol (a hydroxyl group of the second sugar molecule), and the resulting compound is called a glycoside. Glycosidic bonds are readily hydrolyzed by acid but resist cleavage by base. Thus disaccharides can be hydrolyzed to yield their free monosaccharide components by boiling with dilute acid. N-glycosyl bonds join the anomeric carbon of a sugar to a nitrogen atom in glycoproteins and nucleotides. Cn(H2O)n – 1 and that of trisaccharides is Cn(H2O)n – 2 and so on. These are also compound sugars and yield more than 10 molecules of monosaccharides on hydrolysis. 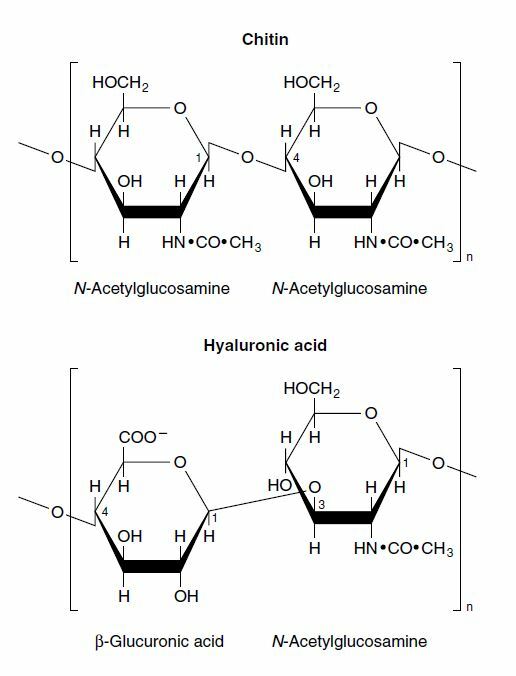 These may be further classified depending on whether the monosaccharide molecules produced as a result of the hydrolysis of polysaccharides are of the same type (homopolysaccharides) or of different types (heteropolysaccharides). Their general formula is (C6H10O5)x.